Beverly's violin lessons are one hour, 45 minutes or 30 minutes for children, depending on student requirements. Most lessons are afternoon and evenings during the week. Morning lessons are available on Saturdays only. 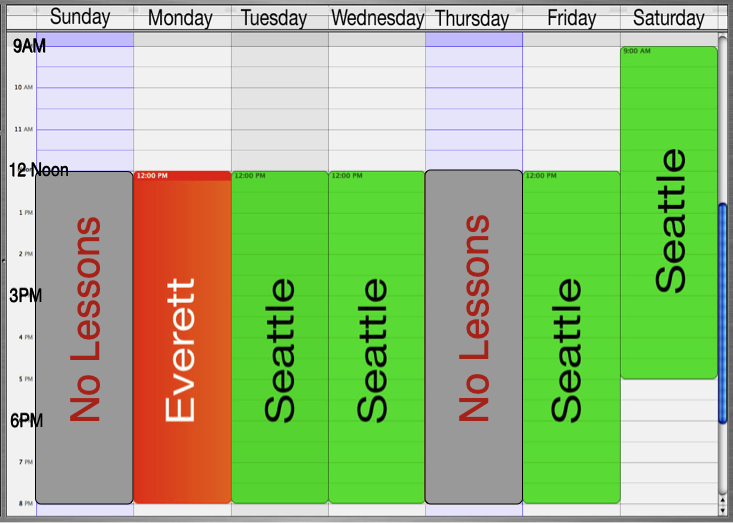 Lessons are available at the Everett studio on Mondays only (see chart below). Playing with others can provide an outlet for socialization and companionship. Community bands and orchestra, such as the Seattle Civic Band, welcome new members. Victory Music, a non-profit that supports local acoustic, jazz, blues, and folk music hosts open mic events throughout the region for all skill levels from beginner to expert. Hoey’s wife knew of his dream and encouraged him to follow it. “She’s very pleased that I’ve taken the plunge and she’s glad that I find so much enjoyment in it. Sometimes she’s even pleased with the music,” he adds with a laugh. Hoey’s whole family is supportive. When asked about his children’s reaction, Hoey states with a chuckle “I have teenage boys, they don’t talk much. When my younger son hears me practice, he’ll pop his head in and say it sounds good.” Hoey says a lot of it doesn’t sound good, but since “my immediate goal is to play for myself and enjoy it, for myself,” he’s happy for the support.